Yep, this is the weekend you have waited your whole life for. Will Ferrell & Jon Heder’s Blades of Glory is hitting movie theaters this weekend & I know you’re too excited to concentrate at work, I know you. 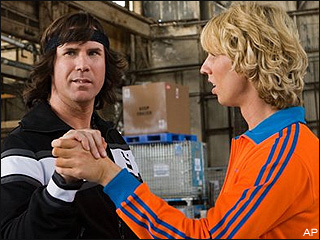 Blades of Glory sees Ferrell & Heder star as two rival ice skaters who were banned from the figure skating sport who find a loophole in the rules & team up together as a pair. Should be a rollicking good time, for a Farrell movie. Also debuting this weekend, is the new film Meet the Robinsons. In this animated feature, boy genius Wilbur Robinson creates a machine to recover the lost memories of the past. Actually looks like a good family movie. Next up we have The Lookout, which is about a former high school hockey champ who outwits a mob of criminals who plan on robbing the bank where he works as a janitor. Do I hear, skip? And finally, Peaceful Warrior hits the screens this weekend. The film focuses on a stranger who leads a gymnast on a spiritual journey that will change his life. I’m also hearing skip on this one. With Blades of Glory at your grasp, I feel that you only need to see one movie in the theaters this weekend, and make it a matinee at that!